The more time passes, the more people seem to appreciate the leadership and genius of Abraham Lincoln. Four years ago, much was made of the bicentennial of his birth. Right now, much is being made of an outstanding movie that focuses on a very brief period at the end of his life. Ever since I was a child reading and re-reading a 1930’s biography of Lincoln that was passed down to me by my aunt, I have admired Abe. And ever since I married a collector of political items, we have searched for affordable antiques that have something to do with Lincoln. Of course, Jim wants campaign items, which are very rare and very expensive, indeed. I’m not quite so picky. 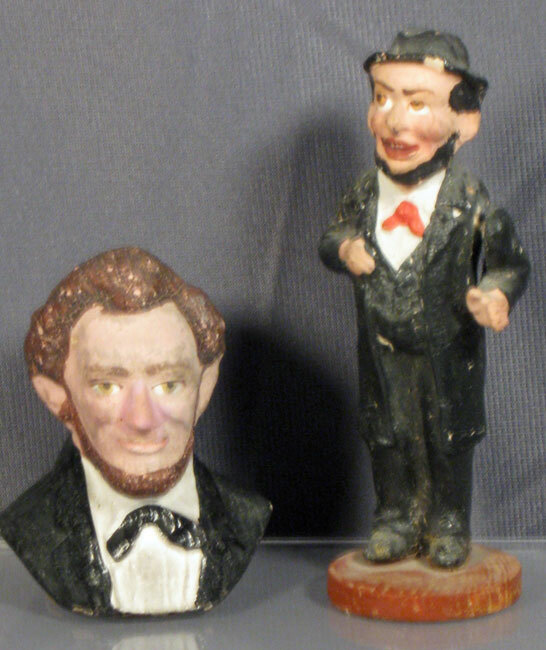 The bust of Lincoln on the left is a small candy container about three inches high that was most likely made in Germany. A circular plug in the bottom can be removed and the hollow interior would have been filled with tiny candy pellets. In general, candy containers from this era (about 1920 – 1930) are getting harder to come by. They have been a “hot” collectible for the past forty years. The unusual full figure of Lincoln on the right has a moveable arm and stands about four and a half inches tall. At first glance, he does not appear to be a candy container since his base is merely a disc made of wood. However, on the bottom are traces of glue. Very likely, this figure was originally glued to a cardboard box that would, indeed, have held candy. I am very fond of both of these pieces. The bust, especially, is a very good likeness of Abraham Lincoln. The other piece, which I must admit could easily turn into an Irishman for St. Patrick’s Day if painted differently, is funny and charming in its own right. And while you do see a bigger variety of vintage Washington party favors, you just don’t see Abe very often. Happy Birthday, Abe! I, for one, am glad that you continue to be recognized as one of the greats. This entry was posted in 1800's, 1920's, Americana, Carol, Holiday, Political, Toys, Weird. Bookmark the permalink.